I am so excited about this giveaway since I've been talking fitness a bit here. These tanks are so stinking cute, wouldn't you agree? Check out Strong Confident You's etsy shop here. Look at all the cute options for colors and sayings. On Friday I will pick 2 random people from the comment section, and they will each get to choose a tank of their choice! Just leave me a comment telling me which saying you'd like. For an extra entry, "like" strong confident you" on Facebook. p.s. 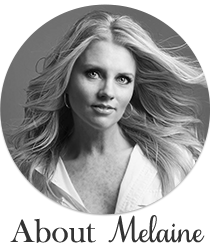 Carrie and I are hoping to launch our new fitness blog in May! 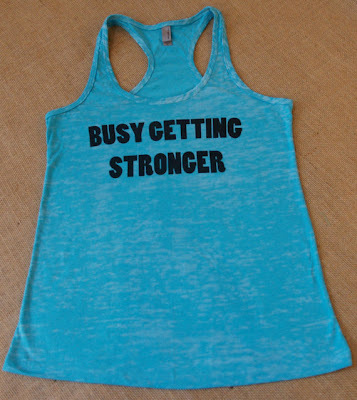 I love the "Busy Getting Stronger" double meaning as well. fight like a girl - yay! I hope I win - I love them. and I liked on Facebook! Thanks again. Fight like a girl... that is soo cute!!! Busy Getting Stronger - Amen! I can not wait for your fitness blog. Hurry...hurry! Love "Every single day"; motivating! These are great! I love Fierce and Just. Keep. Going. Tough to choose! 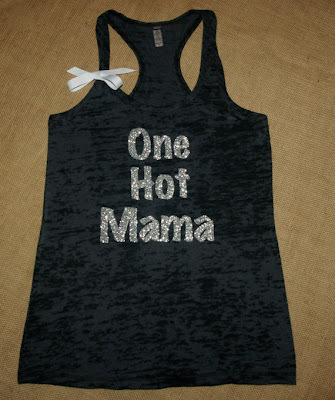 Loving the ONE HOT MAMA tank!! 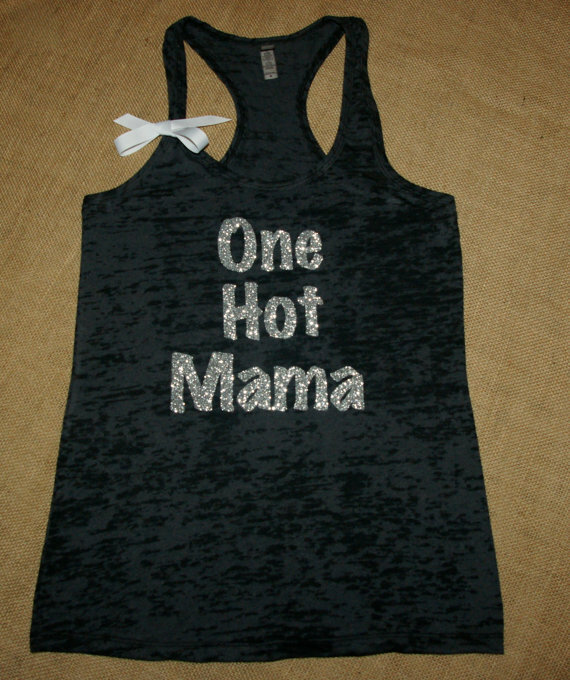 I love the 'one hot mama' tank! I love these! I have just started my fitness journey and have lost 11 pounds since starting just over two months ago. This sounds like a small amount, but considering the unhealthy lifestyle I was living before this is a great accomplishment and I am working hard in the gym most days of the week. Fight like Girl! SO appropriate for my black belt test I'm training SO hard for :) Yikes! ItS a tie.....fight like a girl and busy getting stronger. I would love either one of these! Thanks for the chance to win! I love all of them! Especially the "One Hot Mama". And I "liked" them on FB! Thank you! I would definitely get the tank that reads "I'm a Mom, I do it all" with a 3 on the back. Thanks! Please Please pick me! I love your blog and tshirts! I like the one that says fight like a girl I'm a girl and it would mean the world to me If I won! If I win can you comment on my blog for email!? I like the "one hot mama". The sparkles and bows are so cute! I love fight like a girl!! Love it! What great shirts! I think I like the pink "Fight Like a Girl" one. I just ordered from her! I ordered the "I Don't Sweat, I Sparkle" Tank, but I also want the "Sore today, Strong Tomorrow" and the "Endorphin High" ones! I like the Every Single Day tank! Love the tank that says Fierce. Loving, "fight like a girl". Love the "Mommy of Two"!! Too cute! "Every single Day...No excuses" My fave!! I love Busy Getting Stronger!!!! So awesome. Fight Like a Girl is my fav. So cute! Loving your blog as usual! I love the "I'm a MOM, I do it ALL" tank. Love it!!!! Love, love the - This Isn't Sweat It's Dedication tshirt. Love the fight like a girl! I have my last round of chemo for breast cancer in 2 weeks and have been fighting liking a girl and am ready to get stronger. these are adorable! I'm hoping to train for a 13.1, so I love the 'in training one,' would be great motivation! Busy Getting Stronger! I can't wait for your fitness blog! Yay! My fave is "Don't Let The Cute Fool You. This Girl Is Tough." Love it! 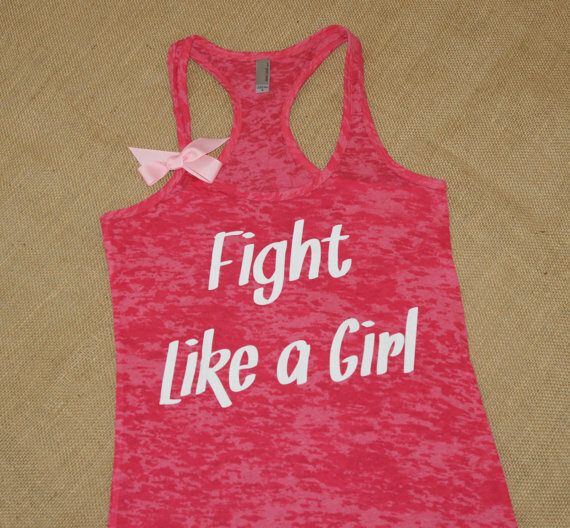 I love the "sore today, strong tomorrow" shirt or the "fight like a girl" one! They are all so cute! "Busy Getting Stronger" is great! thanks! I love "Busy Getting Stronger" although there are a couple others that are in the running for favorites!! They are all so cute! Thanks for the fun giveaway!! I also liked " strong confident you" on Facebook! I also liked "Strong Confident you" on Facebook. Love these! 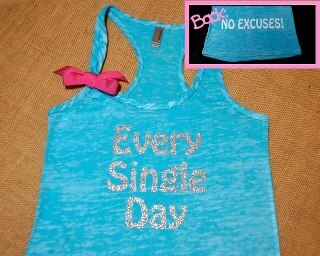 "Every single day..No excuses" super cute! I love 'Every single day, no excuses!' Would be a perfect fit for this mama of three sweeties-a week into doing the Insanity workout! I love the "One Hot Mama" for my sister of 4...almost 5!